IPE is an incredibly strong, dense wood that naturally resists fire, rot, decay and mold. IPE is a naturally rich, dark brown color and will gradually fade to a brownish grey if it is left untreated. 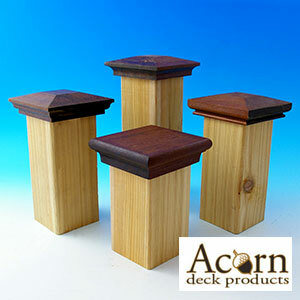 All IPE post caps by Acorn Deck Products will come pre-oiled. If you would like to maintain the dark brown look, simply re-oil the post caps every 6-12 months. DecksDirect offers 2 great products for use on IPE or hardwoods; Penofin Hardwood Formula and Ipe Oil Hardwood Deck Finish.